This 2x10 Rocks!! This cabinet sets a new standard for what 2x10 cabinets are capable of. No longer do you have to sacrifice bottom end to have that tight snappy punchy character 10s are known for. Tremendous punchy tone with great bottom end is the result of combining our terrific porting system and hardwoods with careful selection of the 10" speaker. For our standard model we're using the Celestion G10n driver, that really excels at all things 10! 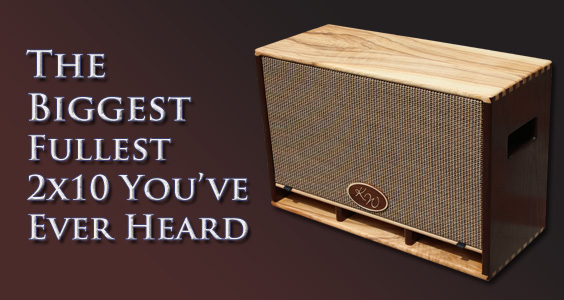 It might not be the most common 10" speaker on the market, but it is certainly the best for our design. With our partly removable back, you essentially get 2 great speaker cabinets in one. When opened you get a more vintage vibe from the 10s but still with tremendous clarity and full bottom end response; And when closed you're in a whole new world of tight big-bottomed tone that you've probably never thought possible from 10" speakers. And all of this in a tiny SUPER-PORTABLE PACKAGE! The ST-210 has all of the same great features found throughout the ST line including solid dovetail joinery, a partly removable back, mono jack, and premium wiring and hardware. If you're a 10 fan looking for something better, or if you're simply looking for something a little different, this 2x10 cabinet is for you.